Here’s David Wright, complete with orange t-shirt and sticking-out tongue. This is the first time I’ve used decals. Up to now I’ve painted everything by hand, but the pinstripes, logo, numbers, etc were just too detailed so I decided to give decalling a try. I used MicroMark clear inkjet decal paper. You just print the decal right onto the paper and give it a clear coating (MicroMark sells some special decal stuff but I just used Krylon clear matte spray). After that you apply it like a regular water-slide decal. After the decals dried I painted over them with gloss varnish to match the lego sheen. It was easier than I thought, and I’m pretty happy with the results. 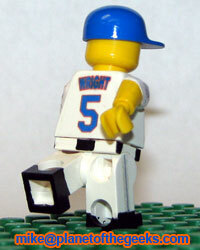 Now that I’ve done Wright, I have a uniform template I can use to make other Mets really easily. All I have to do is change three text layers (front number, back number, and name) and I’m ready to go. Really the only problem I have with it is it raises the Minifig Race Issue. If I were to make Reyes, if I used a regular yellow head, it would look weird and I don’t think he’d be identifiable as Reyes. But if I use a darker skin color for Reyes, then yellow becomes “white” and now Wright looks weird. I went through this same mental dilemma when I was thinking about making Firefly minifigs and I never resolved it (or went forward with the Firefly stuff). I’m not sure what other customizers do. One guy who makes Halo minifigs uses yellow for everyone, but the Sarge just doesn’t look right to me. Maybe if I continue I’ll go back and redo Wright with pink skin, but as a standalone piece I like the way he came out. IMO yellow identifies as white — in other words I don’t see the problem. Adding a “black” Reyes doesn’t alter the Wright model at all. What do the Simpsons do? What program did you use to make the decals? Hey there, I am looking for these decals. customminifigs.com has so many different ones but I can’t find the sports ones. Any advice you can give would be appreciated. Awesome stuff. Yeah, you should sell these. maybe on eBay? That’s awesome! My son is begging for one for his birthday. Would you consider selling them? If not, would you consider sending me info on how to make them? 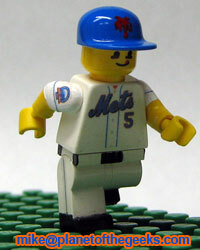 Where can I buy the Lego baseball figures? What paint do you use to paint them when you use paint?